Their primary habitat is grassy plains, savanna and open woodlands. The head and body of males measure from 5.6-8.3 feet (1.7-2.5 m). The tail is an additional 3-3.5 feet (0.9-1.1 m) in length. They stand approximately 4 feet (1.2 m) at the shoulder. Females of the species are 4.6-6 feet (1.4-1.8 m) in length with a similarily long tail. Females are approximately 3.5 feet (1.1 m) at the shoulder. Male African lions weigh between 330-550 pounds (150-250 kg), while females are 264-400 pounds (120-182 kg). 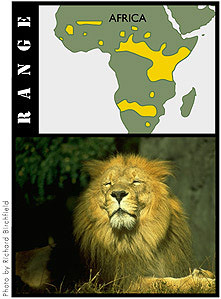 Both male and female lions are tan in color, allowing them to camouflage among the light colored savanna grasses. However, male and female African lions are sexually dimorphic (there are observable physical differences between the sexes). Males have a mane that can range in color from light to dark brown, to even black. The mane helps protect the lion’s neck during fighting and make him appear larger to competitors. In the wild, males 12-16 years, females 15-18 years. In captivity, about 20 years. Prey generally consists of wildebeest, zebra and the varied ungulates (giraffes, buffalo and gazelles). Occasionally lions will hunt the young of elephants, rhinoceros or hippopotamus. They also sometimes scavenge food, chasing hyenas and other carnivores from their kills.